News just in from Michael Galati at Galati Yacht Sales that he and Chris Turner have signed the 30m motor yacht Irish Rover for sale. 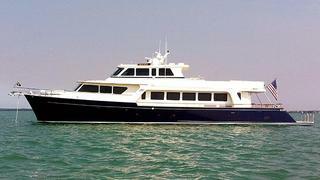 Built by Marlow in 2011, she accommodates up to 12 guests in a main deck master suite, VIP stateroom and two double and twin cabins while twin Caterpillar C-32 Acert engines give her a cruising speedv of 20 knots. Irish Rover is asking $6.65 million.